Peel the kale by removing the toughest part of the stalk, then cut it into strips and cook in a pan with a little oil and half a cup of water, add salt, stir and cover with a lid. Stir from time to time checking that doesn't stick to the bottom, adding a few tablespoons of water if necessary, until the cabbage is cooked. Meanwhile cook the millet in vegetable stock, after rinsing under running water using a fine mesh strainer. After about 20 minutes, add the kale to the millet and finish cooking it. When cooked grease the molds with oil and pour the millet with the kale, compacting well in molds and smooth it down with the back of a spoon, then bake in the oven for 15-20 minutes at about 200° C.
After this time, turn out the millet on individual plates, garnish with cherry tomatoes in oil and serve. 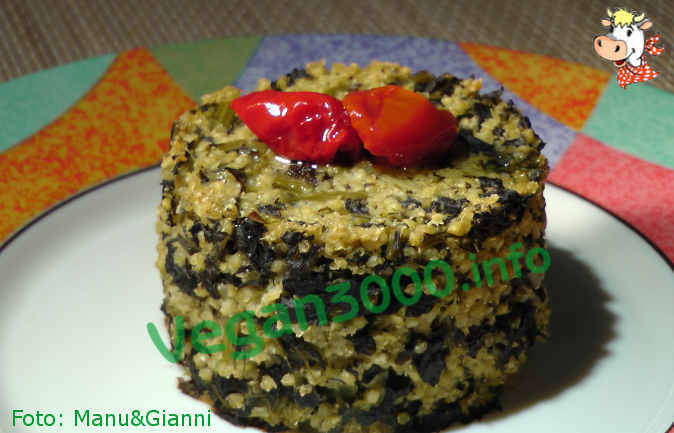 Una preparazione semplice e gustosa per chi ama il cavolo nero (come noi!). Slurrrp!! Questa ricetta è ottima anche con le cime di rapa o con altre verdure a foglia verde. Sono poi tanto diversi da noi?